KmdrProperties is a Konqueror plugin for displaying and modifying properties of Kommander script files. 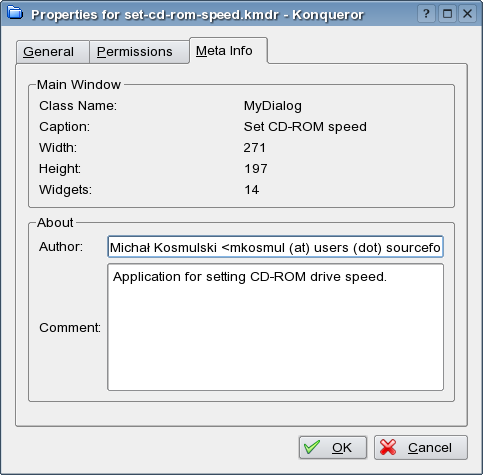 When the plugin is installed, an extra tab is added to Konqueror's Properties dialog for Kommander script files (these usually have the .kmdr extension). This tab displays some information about the script's main window, such as its caption, dimensions and the number of widgets used and allows viewing and editing of the Author and Comment properties. KmdrProperties is free software, licensed under the terms of the GNU General Public License. For more information, visit Kommander File Properties Plugin homepage (hosted by kde-apps.org).